What Type of Noise Scares Snakes Away? 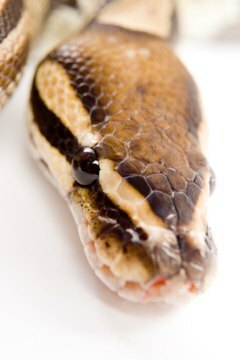 Most people don't realize snakes don't have ears which makes them deaf. It doesn't matter what kind of noise you make to scare the snake away, it won't hear you either way. It is actually the vibration of the noise that frightens the snake. There are many different ways to scare snakes into slithering away. Snakes are very fearful creatures so it doesn't take a lot to scare them away. The best method to scare them is to make fast movements. A lot of times, just chasing the snake away works very well. Another thing to try is to stomp hard on the ground. The snake will not hear the noise, but it will get scared off by the vibrations the stomping makes. If you don't want snakes around, you need to reduce hiding areas for snakes. Common places that snakes like to hide are in piles of wood and rocks, tall grass, under boards and sheets of metal, and in brush or shrubs. Snakes feed on rats, mice, lizards, frogs and other small animals. Eliminating the population of these animals around your home greatly reduces the number of snakes. Snakes are attracted to places where they can easily find food. If they have a hard time finding food in a certain area, they will not stay around for very long. To avoid getting bit by a snake, you need to always wear shoes while you are outside. Even if you are not positive there are snakes around, it is better to be safe than risk getting bit. Never get too close to a snake or try to touch it. A snake will only attack if it feels like it is in danger. Give the snake plenty of time and space to escape instead of trying to attack it.